The Historic Complex of Split with the Palace of Diocletian is both an archeological and an urbanistic monument that has been in use from Roman times. At the end of the third century AD, the Roman Emperor Diocletian (from local Illyrian origin) built his palace here. He spent the last years of his life in it, after abdicating in 305. After the fall of the Roman Empire, his palace was divided into small houses for the local population. Diocletian's mausoleum was turned into a cathedral. Romanesque churches from the 12th and 13th centuries, medieval fortifications, Gothic palaces of the 15th century, and other palaces in Renaissance and Baroque style make up the rest of the protected area. The historic center of Split is relatively small, and for the most part confined within the walls of the former Diocletian's Palace. It's also unbelievably tricky to find your way. On my first foray into the palace to find my hotel, I accidentally found myself at the other side of the city center without any effort. So I had to get in again and navigate the narrow streets until I suddenly stood at the doorstep of Hotel Slavija. One of the most lovely places around town is the Narodni Trg (People's Square), the heart of the Venetian city. It holds a number of terraces for lunch (octopus salad!) or just a coffee. Great for people watching ánd it's where the iconic 15th century astronomical clock can be found. The Roman remains of Diocletian's era are cluttered around the Peristilium, just behind the Silver Gate. This is where all tour groups end up; the square is busy all day. There's also a black sphinx at this location, which was brought in by Diocletian himself from a campaign in Egypt. His (former) mausoleum stands next to it, now a cathedral. A strange octagonal building full of exuberant sculptures and works of art. Split might not be the most beautiful city on earth, it has lots of atmosphere thanks to its original layout. And it's a perfect transportation hub for the rest of the region, by bus or by boat. On entering the eastern gate into the historic center of Split, enclosed within the walls of Roman emporer Diocletian's Palace, I was immediately drawn to the Cathedral of Saint Domnius and its beckoning bell tower. The view from the tower was spectacular, and I was treated to an early morning 360 degree panorama of city walls, historic stone architecture, and red-tiled roofs, set against a backdrop of lush green peninsulas and the deep blue waters of the Split Channel. 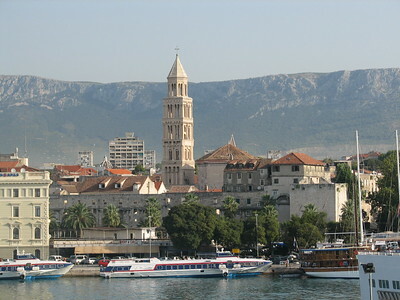 Split has been a World Heritage Site for almost 40 years, and the committee made a good choice in those early years. The city offers a rare opportunity to tour a historic Roman palace, which has now been subsumed into an urban environment. The columns and arches of the palace are still on display in the Peristyle, the palace court, while the mausoleum of Diocletian was converted into the Cathedral of Saint Domnius some 300 years after it was constructed. I particularly enjoyed exploring the nderground vaults beneath the city, which give perhaps the best view of what the palace may have looked like in ancient days. Diocletian was the first Roman emperor to voluntarily abdicate the throne, and he certainly picked a spectacular spot on the Dalmatian coast to spend his remaining days. Logistics: The Historic Center of Split is very easily navigable on foot. I visited this WHS in April 2014. It's an excellent base to visit the 3 other WHS nearby. I spent 4 days here and I would have stayed longer had I had the possibility. 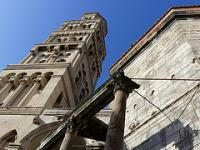 The historical complex of Split is actually within the Diocletian Palace itself! So there are several houses and buildings that have a Roman Palace facade thousands of years old. This is immediately visible from the waterfront or else from the Peristil Square. In the Peristil, just after the Silver Gate, there are several Roman buildings from the 3rd/4th century AD to visit: the Mausoleum of Diocletian (now the Cathedral of St. Doimus) with its octagonal shape very similar to a baptistery, the vestibule, the underground passageway beneath Diocletian's Palace. It's also possible to climb the belfry to enjoy a panoramic view over Split, although a short rest beside the black sphinx statue from Egypt would be equally rewarding. The actual early Middle Ages baptistry can be found in the former Temple of Jupiter with a beautiful cross-shaped baptismal font. The Golden Gate should not be missed with its intricate carvings and statues but also to see the huge Gregorius of Nin statue and another tower. Another interesting square is the Narodni Trg with its Venetian aura, a beautiful clock tower and the famous balcony from which Mussolini delivered his speech. I enjoyed Split and would visit again in a heart beat. Not only does it have much to offer, but many islands and other WHS are just a ferry ride away! I really enjoyed my stay in Split, not only for the obvious reason of finally getting to see the only Roman Emperor's palace still existing, but also for its very pleasant Mediterranean ambience and beautiful seaside setting - the Riva promenade especially. Diocletian's Palace is, of course, the major attraction. Covering the entire Old Town of Split, it features many historic monuments, including the Cathedral which was built over Diocletian's mausoleum. I found the underground passages to be the most interesting part. On the downside, the city was totally crowded with tourists, because it is quite a popular cruise port, so visits should be timed to the mornings and evenings. Split also makes a great base for trips to other WH sites, including Trogir, Hvar and Sibenik, but also to places such as Mostar, Dubrovnik, and the Plitvice Lakes. The special feature of the old town of Split is that a medieval town has merged with a Roman Palace, and this is still visible. 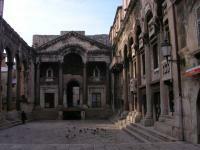 The centre of the historical city is the Diocletian's Palace, built by the Roman emperor as his retirement home. Diocletian was the only Roman emperor who abdicated voluntarily. The former palace complex occupies the eastern half of the old town. 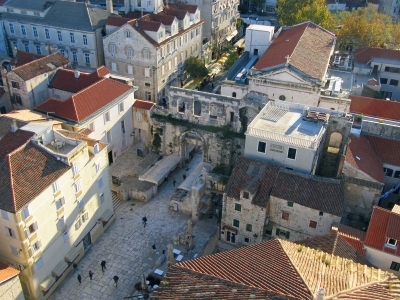 In the medieval ages, the appearance of the palace has completely changed, in the 7th Century the first inhabitants of Split began to settle within the palace walls. Over time, the city grew together with the former palace and the original functions of its components changed. I enjoyed it much to explore the narrow streets, to look for the remains of the palace and to see how they were incorporated into the houses and buildings of the medieval town. Parts of the palace walls have been preserved, like almost the entire northern wall at a length of about 200 metres, and give an idea of the dimensions of the palace. 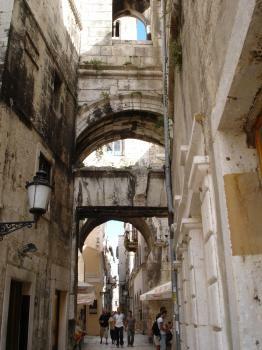 We entered the old town through the eastern gate, the Porta Argenta. Outside the gate is the Pazar, the daily market with fruits, vegetables and other foods – it is very busy, locals and tourists buy there. After a few metres we reached the central square, the Peristyle, an open hall with columns on three sides. All around the peristyle are the main sights: the octagonal mausoleum (now the Christian cathedral), right next the bell tower from the 14th Century (you have a beautiful view over the old town and the harbour), the vestibule and the stairs to the Podrumi, the cellars of the Palace. These underground rooms should not be missed, they are well preserved and have surprisingly high ceilings supported by massive pillars. During our visit there was an exhibition of contemporary Croatian art, but there are also stalls selling souvenirs, jewelry and the usual kitsch. The western palace gate, the Porta Ferrea, leads to the People's Square (Narodni Trg), in the Middle Ages the centre of the city. Around the square are beautiful buildings mostly in the Gothic style, many cafés and restaurants. We finished our visit with a walk on the Riva, the waterfront of Split, along the southern palace wall. If you do not mind the crowds of tourists, it is worthwhile to explore the old city and the former palace. Same as other reviewers here, what impressed me most was the very fact that an ancient Roman palace evolved into a city! This is amazing and creats a sense of unity and intimacy when visiting this unbelievable complex. There's even Jupiter's Temple still standing with its original Roman ceiling ornated with masks! You should definitey take your time to explore the palace (although I found one day enough for this purpose). Other nearby attractions are the archaeological museum with a beautiful garden protraying important Roman findings from the area (I would say the garden which is free of charge is more interesting to visit than the interior of the museum), the Mestrovic Gallery and Church (both certainly merit a visit) and the lovely beaches. Day trips are possible to Salona (the nearby Roman settlement) and Torgir - a WHS on its own right, both accessible by local buses. Split is quite an industrial city but the old town is far from that. Everywhere in the old town you can see the remains of the old palace. When you are walking through an underground alley filled with kitschy souvenir stands, you hardly notice that you are actually inside the palace. Built on the ruins are lots of little restaurants and shops. It's nice to just stroll around and to figure out where in the palace you are walking. I live in Split so I know a lot of its history. Palace was built between 293-303 AD for Roman Emperor Diocletian, who after 'retirement' came to live there. 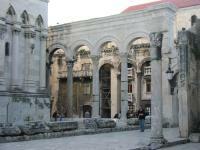 Some legends indicate that Diocletian was from Salonae, near-by center of Provincia Dalmatia. Palace consists of 2 parts: maritime villa in south part and castrum in north. all representative objects are situated in south side: Peristyle, 3 temples (Jupiter, Cibelle, Venus), Emperor's mausoleum (today Dome of St. Domnius). In 6th or 7th century town was inhabited by christians who raved Emperors mausoleum and turned it into church. Location of remains of Diocletians body is unknown. Domnius' body was transfered to new church thanks to Pope. In 12th century Belltower was added and it was reconstructed in 19th century. The historic complex of Split is unusual in that it is entirely situated within the confines of the walls of Diocletian's Palace. When the Roman Empire crumbled, the locals huddled together for protection within the then-abandoned imperial residence, and they have remained there ever since. Due to this fact, Split has one of the strangest and coolest main entrances to an old town: through the main gate of an old palace entering up the stairs into a remarkable presidium. There's not much to see these days of Diocletian's living quarters, just some bare rooms with a few artifacts, but what is most striking is how certain structures of the palace, temples etc., have been coopted and transformed for the use of the current citizens. Split has a lovely little warren of streets to explore and some excellent cafes for sitting and watching the world go by. It's a great introduction to life on the Croatian coast and easily reachable by ferry from any number of Adriatic ports, including daily sailings from Ancona, Italy. I have been to Croatia several times because my father was born in a small village near Split. This summer was the first time I actually toured the Palace, and it is truly fabulous. The church and the museum upstairs are definitely worth seeing. Holy relics contained in their sarcophagus were fascinating, as were the many artifacts such as crowns, chalices, and robes worn by former bishops and priests. The palace is in great shape (people live within the walls) and was obviously well built. On the outskirts of Split, there are miles of ruins but the most impressive is the aquaduct. One small complaint about the palace is that there was a fee for entering the museum and some other parts of it. The Tetrarchy: Built by Diocletian for his retirement in 305 as per the rules of the Tetrarchy. Modelled after: Republic Square was modelled after Venice's San Marco Square.